Now cryo-face therapy and light therapy is been actively used in the skin rejuvenation centers to help remove wrinkles, vascular problems, acne complex rejuvenating the face, neck, and chest - so-called cryo-face and light therapy consists of classical, traditional stages of salon care, and the various methods of cryo-therapy. Cryo-face therapy and light therapy - is a procedure to improve the aesthetic appearance and contour of the face, body, getting rid of cellulite; excess localized fat deposits, improving elasticity, slowing the aging process and aging of skin. 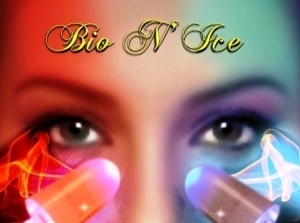 The new word in the fight for youth and beauty is Bio N’ Ice. Note: The skin should be cleaned before the procedure and the make-up free. •The application should take a total ofabout 2 minute. The volume of thecrystal is sufficient for a complete up to two applications. Once an ice crystalhas been applied, remove the now freed from ice connectorfrom the hand piece and repeat procedure of the productionof the ice crystal as described abovein the instructions. •After use, please wipe the face immediatelyonly gently with a soft paper towel to removeexcess fluid from the skin surface. •Pleasenever tumble dry facial skin with a towel completely; otherwise the resulting protective layer of green tea extract or any extract will beremoved! 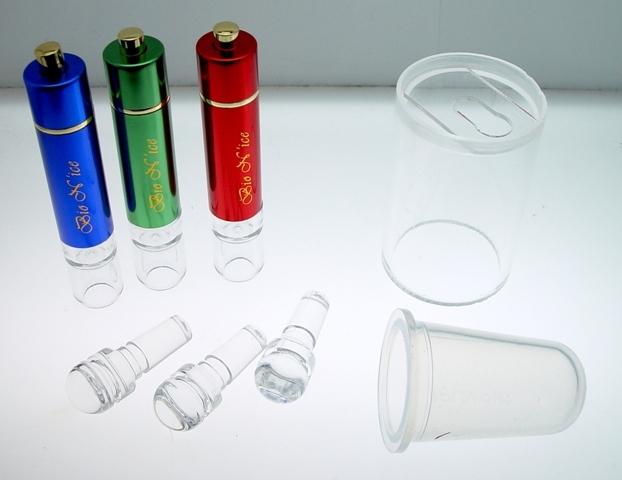 • Separatecheck the hand piece of the connector with the remaining ice crystal, place the ice crystals back into thesilicone mold and set the device back into the freezing chamber of the refrigerator. What do we mean by light? The term ’light’ normally applies to the visible part of the electro-magnetic spectrum. For human beings, that means wavelengths between approximately 380 and 780 nanometers (nm). These are approximate values because to the human eye, visibility fades out gradually rather than breaking off abruptly. As a result, no exact range can be defined. Infrared and ultraviolet rays are not in the light range people can see, but are still generally referred to as ’light’. Green is 510 to 565 nm. HOW IT MAKES US FEEL: Gives us the ability and confidence to…. Save money with less Cosmetics and Skincare products and treatments. Be noticed. You will look and feel better both on the outside and inside…Its up to you if you decide to share your secret! Blue light has a wavelength of 420 to 490 nm. This means it is visible to the human eye. However, indirectly perceived blue light can affect our behaviour too. As US researchers recently discovered, the human eye has special photo-receptor cells that react to blue light by influencing the body’s own sleep patterns. Researchers have been examining the various beneficial effects of blue light for a long time. Blue light has, for example, been shown to have a positive influence on depressive moods. This has led to the development of special blue light therapy applications that are used particularly during winter months. Blue light with a wavelength of 453 nm stimulates various positive processes in the human body. How is blue LED light used? Ever since the pain-relieving properties of blue LED light became known, research has been seeking ways of making it useful for medical applications. The goal was to quickly develop a mobile application of blue LED light, and to make it available to patients – for example, people with back pain. A research team has succeeded in developing a mobile LED that enables blue LED light to be used directly on areas of the body both for paid reduction and soothing. This therapy form can be used daily and many areas of the body. Unlike UV rays, blue LED light is not toxic for skin cells. This means its pain-relieving and protective properties can be used broadly. In particular, the fact that blue LED light induces the body’s own natural processes – without the need for chemical substances – gives it a crucial advantage over other therapy forms. How safe is blue LED light? Safety concerns are a common occurrence with any type of therapy. But with blue LED light, there is no need to worry. Unlike UV rays, for instance, blue LED light is not toxic providing therapy recommendations are followed. Applications with blue LED light are absolutely safe. This is due to the high-tech engineering, and also the wavelength used: 453 nanometers (nm). It was established that blue LED light with a central wavelength of 453 nm doses of up to 250 J/cm² is not toxic for skin cells. · Designed to penetrate deep into the tissue. · Targets the bacteria that cause acne breakouts. · Portable and Durable. Easy to carry and use anywhere and “on-the-go”. · Soothing to the skin for helping the reduction of puffiness, stress and overall calming effect. · See results with 2-3 minute treatments twice a day. Bio N’ Ice Green LED Light Therapy is developed to treat specific skin areas that require more attention and for those with sensitive skin. .
What Bio N’ Ice Green led light does? · Use on areas with Melanin/pigmentation, sun/liver/age spots. Discoloration and hyperpigmentation. · Will help accelerate the treatment effects for an overall skin balance. Bio N’ Ice is a safe, effective, painless and scientifically acceptable alternative for the treatment of sun damaged skin.